No water experience needed. Students will learn basic water safety and skills to help them feel comfortable and enjoy water. Students will learn to float without support and recover to the vertical position. Additional skills learned include bobbing, breath holding, rhythmic breathing, opening eyes under water, and alternating and simultaneous arms and leg action front and back. Students must have completed Little Swimmers program or be able to demonstrate Level 1 skill requirements. (Level 3) Students learn to coordinate the front and back crawl, butterfly, and treading water fundamentals are also introduced at this level. Students entering this level must have a Level 2 certificate or demonstrate all of the requirements for Level 2. (Level 4) Students develop confidence and endurance to improve the butterfly and front crawl for greater distances than in Level 3. Elementary backstroke, breaststroke, elements of the sidestroke, and turning at the wall are introduced at this level. Students enrolling in this level must have a Level 3 certificate or demonstrate all requirements for Level 3. (Level 5) Students refine their performance in front crawl, back crawl, butterfly, breaststroke, elementary backstroke and sidestroke, and increase their distances. Flip turns on the front and back are also introduced. Students entering this level must have a Level 4 certificate or be able to demonstrate all the requirements for Level 4.
greater distances. 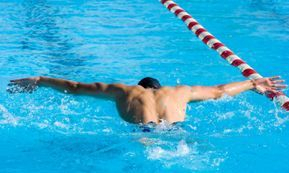 Increase endurance while swimming the following strokes; Front crawl, back crawl, Butterfly, Backstroke, Breaststroke, Sidestroke. Discuss and demonstrate how to use the following equipment while swimming: Pull buoy, Fins, Pace Clock & Paddles. Comments or Questions? Contact Zoe.